A group of top scientists, lead by a legendary Nobel Prize winning physicist, has made a discovery so startling and with such deep religious implications that it sends shockwaves through the corridors of power around the world. As the federal government moves to suppress the research, all of those involved vanish without a trace. 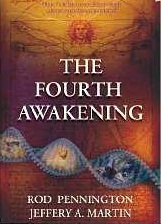 While a work of fiction, The Fourth Awakening is grounded in cutting edge science and an emerging new spiritual reality. It offers readers a glimpse of their future.